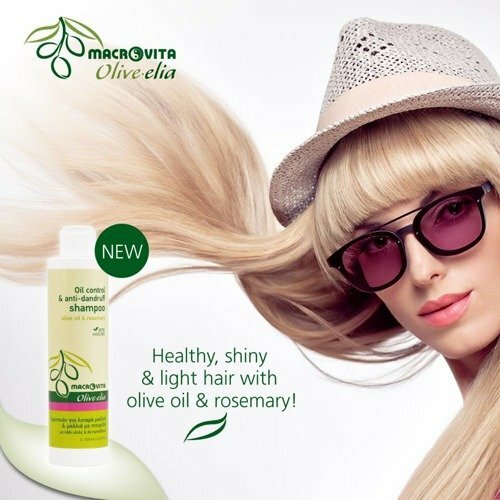 MACROVITA OLIVE-ELIA ÖL KONTROLLE & ANTI-DANDRUFF SHAMPOO Olivenöl & Rosmarin 200ml - der beste Naturkosmetik erhältlich auf der Webseite www.ETERNEL.pl in Kategorie OLIVELIA by MACROVITA Haarpflege. Wir empfehlen! OLIVE-ELIA Oil Control & Anti-dandruff Shampoo improves the health of the scalp, helping to balance oily hair, preventing at the same time the development of dandruff. Cleanses deeply, reduces itching and moisturizes hair leaving it healthy and shiny. Sie sparen 8% (0,70 EUR). In Ruhe zu Hause kaufen und ausprobieren. Innerhalb von 15 Tagen können Sie die Ware zurückgeben, ohne einen Grund anzugeben. Wir sorgen um Ihre Bequemlichkeit, so dass Sie in unserem Geschäft die Rückgabe zu günstigen Konditionen vornehmen können. Copyright © MultiBOX24.pl. Alle Rechte vorbehalten. Shampoo for oily hair and dandruff. Thanks to its valuable ingredients regulating sebum secretion and combating dandruff, improves the health of the scalp, helping to balance oily hair, preventing at the same time the development of dandruff. Cleanses deeply, reduces itching and moisturizes scalp and hair leaving it healthy, shiny and light. MACROVITA Shampoo is free of chemical detergents with high potential irritant - Sodium Lauryl Sulfate (SLS) and Sodium Laureth Sulfate (SLES). Instead of them in shampoo was used a mild, foaming, biodegradable agents obtained from natural raw materials, such as coconut oil. The content of natural ingredients as high as 97%. The formula without parabens, mineral oil (paraffin), Vaseline, propylene glycol, and genetically modified plant extracts (GMO FREE). Apply a small amount of shampoo on wet hair, wash them gently by doing massage. Rinse after 2-3 minutes. Wash your hair again, and then rinse thoroughly with water. For external use only.